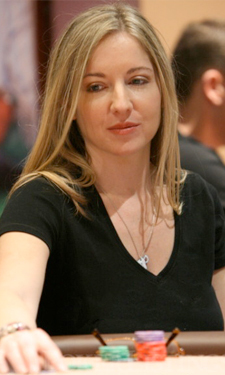 Victoria Coren Mitchell is the first (and so far only) two-time winner of the European Poker Tour. She has been playing poker since she was a teenager and has accrued official lifetime tournament winnings of $2m+ (see “tournament results”, above). She became the 2006 European Poker Champion after winning the London EPT, and was the first woman to win an event on the European Poker Tour. In April 2014, she won the EPT San Remo and became the first double EPT champion. She has also won a series of Celebrity Poker Club on Challenge TV, making her possibly the only person to win both a professional and a celebrity poker competition - and definitely the only person who has had to beat Phil Ivey to win one tournament and Roger de Courcey to win another. Victoria plays regular cash games at the Victoria Casino in London and tournaments on the international poker circuit, especially the EPT and the UK & Ireland Poker Tour. She has also played on Late Night Poker and Premier League Poker for Channel 4, and various other televised poker games on Sky Sports, as well as presenting or commentating on various poker series and writing a weekly poker column for The Guardian newspaper. For the full story, you might enjoy Victoria’s new memoir For Richer, For Poorer: A Love Affair With Poker, which can be found on the ‘books’ page. For a description of the Victoria Casino (read by Victoria), click here.